OK... Not gonna lie... I'm so anxious for my girls to get here. I know that they need to stay in there as long as possible. I'm just saying, for selfish reasons, I want to hold them. Kiss the soft hair on their heads. Tell them in person that I love them. Patience, Jason. Patience. I think about them all the time. What they'll be like. Who they'll resemble the most (Say me. Even if it is Karyn, lie to me. This is the only time it's ok). I can't wait to see my beautiful wife hold our little girls. All of these preparations have me going nuts. We're at 32 weeks and we go to the doctor tomorrow. I can't wait to see my baby girls. Even if it's only through an ultrasound. Seriously though, I would like the twins to weigh 5 1/2 - 6 lbs, at least, when they're born. I want them to be good and healthy. Karyn said, "That's 12 POUNDS of baby!!!". I can't argue with that! Haha. She's doing great. We'll see. Only God knows. P.S. The names on the wall in the picture were painted by my wife's sister in law, April Faulk. How awesome are those! 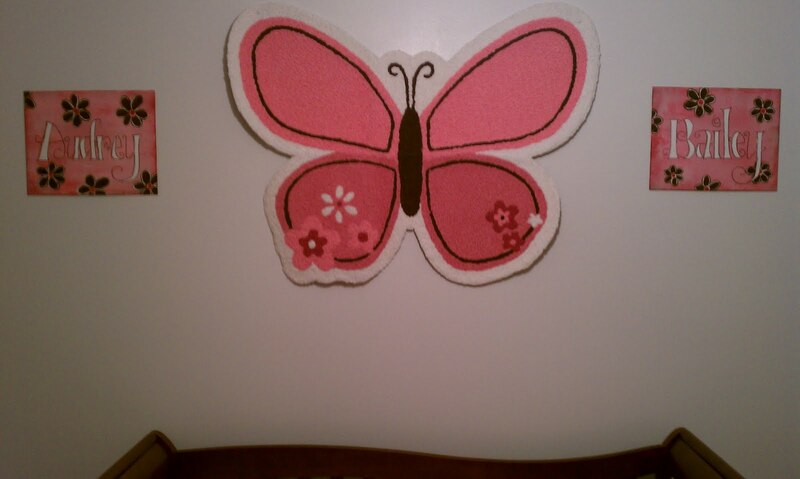 The butterfly is actually a rug. Fits perfectly there IMO.